In a word: Diamond waaaaaaay in the rough. Address, hours & details via Isthmus; reviews at Yelp; listing at Eat Drink Madison; TDPF; official web site (warning: sub-top 40 techno). JM ate the baked macaroni and cheese special and a lemonade. 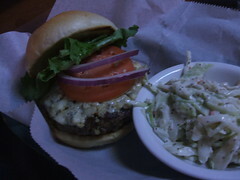 Nichole ate the black and bleu burger. 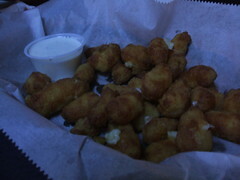 We split some cheese curds. The bill was $18 (with comped curds), or $9/person, plus tip. JM gave Scatz an A-; Nichole gave Scatz a B (see our grading rubric). 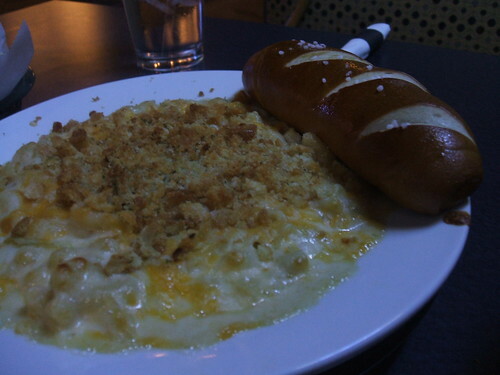 We had a sinking feeling as we wrote this in late August that by the time we post these thoughts on surprisingly good food (particularly the baked mac and cheese special), Scatz will have succumbed to its rumored noise-complaint troubles and closed. It was somewhat hard to get someone's attention to take our order due to a big party that had just arrived upstairs. After ordering at the bar, we checked out the game area. The Skee-Ball was jammed so we played pool (Nichole won as JM sunk the 8 ball wrong) before a league dude came in to stake some tables. Our order arrived sans cheese curds, but the server very kindly comped them to us, the third such gift for the project, because they were late. After just a couple bites of the baked mac and cheese special, JM's mood was markedly more blissful. After a couple more forkfuls of the insanely buttery, well-crumbed dish, he was pondering whether this might be the best restaurant mac and cheese he's had (the competition being Old Fashioned). There were definitely a few different cheeses at work here, from something real and white for stringiness to just a bit of something perhaps nacho-esque or Velveety for a smooth consistency. The large elbow noodles were just on the soft side of al dente. After that, the curds, while good, white cheddar in a nice batter, were redundant, but for once the woman had remembered to bring her own container for leftovers. Bun: buttered, toasted white Kaiser roll. Meat: firm, flavorful patty with some gristliness. Bun/meat ratio: good, but worth noting that after a few chews, each mouthful lost flavor and took on a sort of Play Doh consistency. Cheese: melted bleu, almost more of a dressing than an assemblage of cheesy chunks. Misc. : served with lettuce, a slice of tomato, and celery-seed-spiked but floppy coleslaw. About a 5 of 10 overall. In closing, and as an aside to the Scatz chef: if you every do find yourself in a new situation, and you're still making that mac and cheese, please let us know. It's remarkable stuff and we would hate to lose access to it over hotel customers' lack of earplugs or whatever else is going on at Scatz. YUM! That looks REALLY good (and bad for me)! I've also been surprised at the quality of Scatz's food. Hi. I really like your blog. I just recently got into blogging for some of my classes at Oklahoma State University. I found your blog just randomly searching for ones that will be similar to the one I will be making. Are there any tips you could give a beginner at blogging? My blog deals with the Ranchers Club, which is a restaurant on campus. It is a classy restaurant and dress is semi-formal. It is one of the nicer restaurants in the town of Stillwater. Have you ever been to a similar type of restaurant and was the experience good?